Welcome to my stop on the first-ever Aurifil Blog Hop. Thanks so much Pat for inviting me to share my love of Aurifil threads. I hope you’ve been having fun on this blog hop, collecting the Spring blocks that have been created and leaving comments for your chance to win some Irresistible Aurifil Threads. 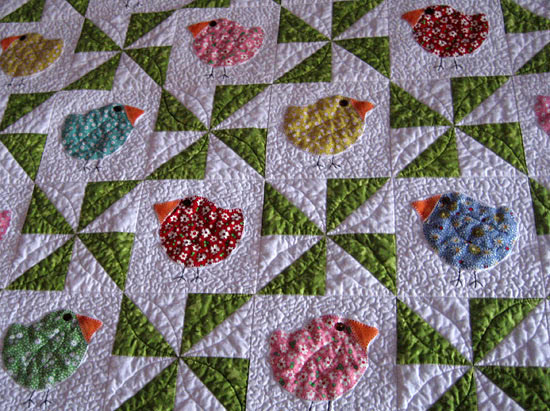 Share your finished blocks in the Flickr group. 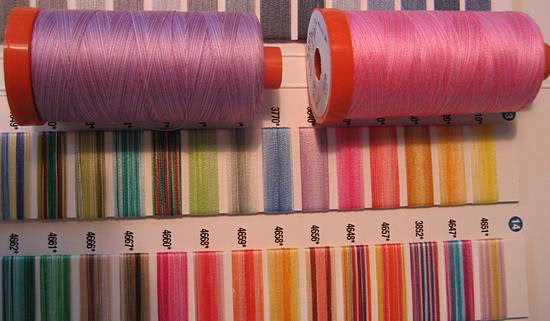 Aurifil makes 4 weights of its 100% cotton Mako threads: 12wt, 28wt, 40wt and 50wt. The larger the number, the smaller the thread. I use the 50wt thread for all of my piecing. I love how thin it is and that it doesn’t add any bulk to my seams when pressed. I love the subtle gradients in many of their threads. I have two nieces and these purple and pink gradient threads get used often. I love that when I use the 50wt thread for hand appliqué, the stitches vanish right into the fabric. I love that I can get gorgeous machine blanket stitch, accurate stitch-in-the-ditch and beautiful dense quilting with Aurifil threads. I’ve been using Aurifil threads for two years and not once has my thread broken. For me, Aurifil threads are irresistible. They make my quilting life more enjoyable and beautiful. Here’s my block: Hidden Star. 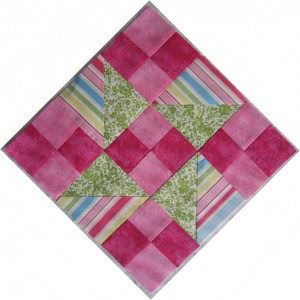 Made up of simple half-square triangles and four patches. Don’t let the on-point layout scare you, it’s super easy to put together. Leave a comment below telling me what’s your favourite season and why? For me, it’s Spring, when the birds return and the flowers and trees awaken from their cold Winter’s nap. Two winners will be selected to win a thread sampler pack containing one spool of each of the different weights of Irresistible Aurifil Threads. Winners will be selected on Saturday. 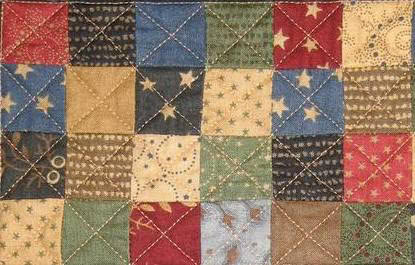 Today (Thursday) is the last day to enter your quilt in this week’s contest Colourful Modern Quilts. Check back on Friday for your chance to vote for your favourite. OOo OOOO. . . Aurifil threads are MOST DEFINITELY IRRISITABLE!!! Thank you SOOOO much for the opportunity to win these!!! one more thing – my favorite season would be Autumn. . or Winter. I love the falling leaves and the smells of baking and all the beautiful colors that come with Thanksgiving and Christmas. I love winter – Christmas, getting to stay inside, all the lovely snow…. I love the beginning of every season, but Fall is my absolute favorite! I love when the air turns crisp and is perfect for sweaters. I love that back-to-school feeling of it as well! I have been using aurifil thread for quite some time now and not only do I like them my machine loves them. (It doesn’t like some others). The colour range is excellent and for hand sewing it is wonderful. Thanks for the opportunity to win. My favourite season here in australia is winter as I live by the coast and love the sea with all its great winter moods. I can never pick my favorite season, it’s always a tie between spring and fall. I love the transitions, the chilly evenings and warm afternoons. And lots of new fabric lines seem to come out then! It has to be spring when all new things are starting to grow again and new projects too. My favorite season is Spring and even though we’ve had heavy snowfall where I live, the promise of Spring is in the air. The budding trees and flowers are my favorites. I like Spring because it is not too cold, not too hot and I was born in the Spring. My favorite season is summer, I love the warm days and wearing shorts and flip flops. Thanks for your pretty block. The colors are really ones I’m drawn to. 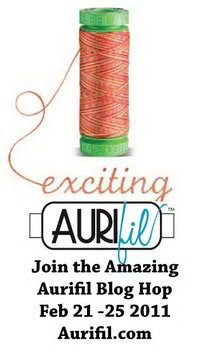 I am eager for the chance to win some Aurifil thread. My favorite season is the fall, with all of the brightly colored leaves, the chill in the air, and the promise of snow to come soon. The colors of fall are some of my favorites! I just tried Aurifil thread for the first time, and loved it! The two that I tried were variegateds and they were so beautiful as well as strong and clean. Please count me in! I love winter..we get lots of snow and it is like a white blanket. 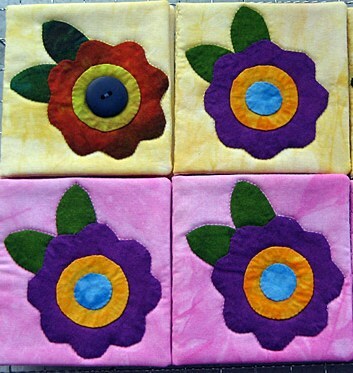 On extreme cold day…what better excuse to stay qlued to your quilting room! I would love to win this thread. On a very tight budget and would love to try. I love the Fall, we are farmers and enjoy the different weather during the harvest days! Would love to win some Aurifil thread! Thank you for the quilt block – quite pretty. Can’t wait for spring. 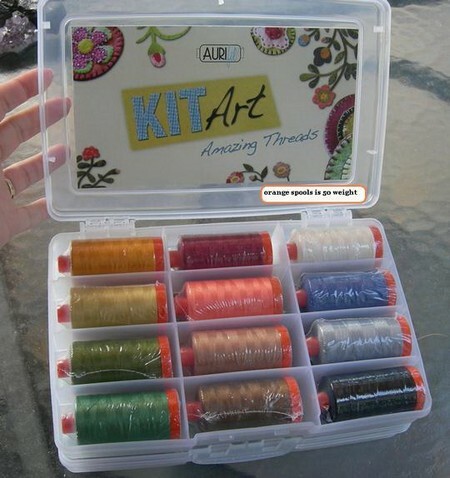 I love using Aurifil thread – perfect for quilting and also really wonderful for making lace. The thread is delicious looking and so springy. What do i like about aurifil thread…i will extol its virtues…so thin but SO strong…i sewed the binding on a queen quilt with it …no breaks…Its easy to thread because its so thin…easily zips thru the smallest eye of the needle…so many lucious colors to chose from…and then there is that CUTE Alex Veronelli…another reason to use Aurifil:> Awesome thread Awesome colors! Awesome Alex!! I love the spring. I live in Minnesota, and winters are sooo long and cold. But spring in Minnesota is just glorious, and a reward for making it through another winter. Thanks for the giveaway and the chance to win such wonderful thread. Beautiful your block and thanks for giving us the chance to win a kit! I love summer, because I enjoy the sun, heat, birds, plants, fresh fruits, sea and the beach, long days that I can sew up late, in short: the happy days that put a big smile on my face! This is the week of my birthday (yesterday was 24), would make a wonderful gift to win the kit! I love spring when things get all green, but I have to say fall is my favorite because of all of the beautiful colors in the trees. I moved to Michigan from Los Angeles because I needed to have seasons again and Michigan falls never fail to amaze me. My favorite season is autumn. I love the cool brisk mornings and evenings, along with the mild days, the changing colors of the leaves on the trees, the many festivities and holidays. It is an exciting time of year for me, one that envigorates me and gets me going! Would love to win some of this thread! I’ve never tried it before and I do sew a lot. Autumn. I love the colors, less rain where we live, my birthday and a time to get away and enjoy it all. Beautiful,when I go to work every day I pretend I’m a star just like your block, Beautiful full of life and ready to go. Denise Fischer Tucson, Az. I love each of the 4 seasons for all their individual personality traits, but Fall is my ‘favorite child’. I have the fishing lake to myself, the colors are amazing, the creatures are fattening and furring up, the days are warm and the nights crisp, harvest is in and canned, dried, jammed…Yep! Love that Fall season! Oh! Spring is most definitely my favorite. And Autumn next. Your block is all SPRING! Very pretty. This blog hop has been fun. Nice prizes too. Fall is my favorite time of year, I love the autumn colors when the trees start to turn color and the temperatures start to cool down. Spring of course!! After the “drabness” of winter, spring brings color back into the world!! It is starting now with some little green shoots popping up through the dirt. Soon there will be some flowers to go with them! Yeah!! Oh, and thanks for the block pattern. I’ve enjoyed this hop. 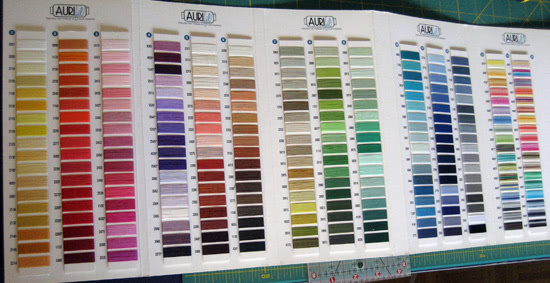 I have become a big fan of Aurifil thread and use it all of the time for piecing and quilting! Spring is definately my favorite…such a welcome relief from the deep freeze of winter, and not too hot yet…and the flowers are a bonus! Love the thread blog hop…very fun! 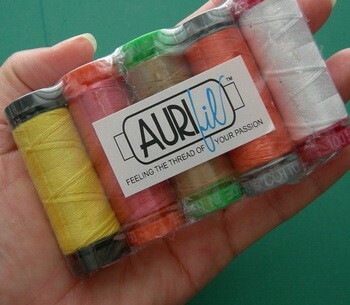 I am an Aurifil addict :) Haven’t seen the varigated threads though…I’m going to search them out. Loved your photos! I love fall the best–the colors, the crisp air, the golden light. I love summer because I love to go to the beach!! I like your block. Thanks. Aurifil thread is on my list for the Bloominton, IN, quilt show. I am a newbie and a borrower but soon to be buyer. I love this thread. My mom loaned me a spool and it is perfect for piecing and for quilting. My Bernina loves it and so do I.
I live in the middle-of-nowhere, and although I have heard of this thread, I have never had the opportunity to use it. I love machine quilting with variegated thread. Spring has always been my favorite; that fact is reinforced especially after this winter. Anyway, thanks for the chance at these lovely threads. I love spring, as I live in cornwall in the very south of the UK everything is bursting intoo bud the daffodills are out in the fields, the primroses are now in bloom, and also the pretty wild garlic ( which is good for cooking as well as being prett. I love fall. The different colors of leaves really sparks my creativity and appreciation of the world. There is never enough time to quilt! The colors of fall are my favorites. The hues of Autuimn make me feel warm and cozy. This is also the time of year that I look forward to beginning new quilting projects that will tide me over the oncoming winter. Spring is my favorite season. Everything is fresh and brand new. After the dead of winter, where I truly feel like the bears in hybernation, I need the smell of the spring flowers. I can go outside without it being so cold and enjoy nature the way God has intended. As I sit outside, I can just listen to the birds chirp, and think of all of God’s creation..